Description: Stock photo of the Mt. Soledad cross with the armed services memorial in the foreground. 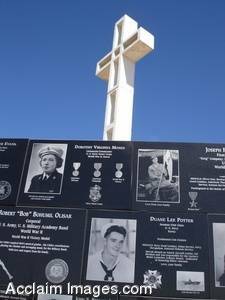 This photo shows a large white cross behind a memorial wall with information about veterans who have served in the US armed services. This picture is available is an art print or may be licensed as stock photography.